"visla redirects here. For the dog breed, see Vizsla. For other uses, see Vistula (disambiguation). The Vistula (/ˈvɪstjʊlə/; Polish: Wisła [ˈviswa], German: Weichsel [ˈvaɪksl̩], Yiddish: ווייסל‎ Yiddish pronunciation: [vajsl̩]) is the longest and largest river in Poland, at 1,047 kilometres (651 miles) in length. The drainage basin area of the Vistula is 194,424 km2 (75,068 sq mi), of which 168,699 km2 (65,135 sq mi) lies within Poland (splitting the country in half). The remainder is in Belarus, Ukraine and Slovakia. 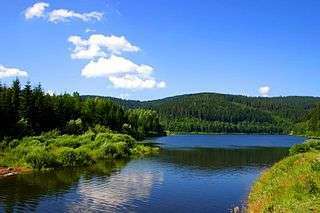 The Vistula rises at Barania Góra in the south of Poland, 1,220 meters (4,000 ft) above sea level in the Silesian Beskids (western part of Carpathian Mountains), where it begins with the White Little Vistula (Biała Wisełka) and the Black Little Vistula (Czarna Wisełka). It then continues to flow over the vast Polish plains, passing several large Polish cities along its way, including Kraków, Sandomierz, Warsaw, Płock, Włocławek, Toruń, Bydgoszcz, Świecie, Grudziądz, Tczew and Gdańsk. It empties into the Vistula Lagoon (Zalew Wiślany) or directly into the Gdańsk Bay of the Baltic Sea with a delta and several branches (Leniwka, Przekop, Śmiała Wisła, Martwa Wisła, Nogat and Szkarpawa). The name was first recorded by Pomponius Mela in a.d. 40 and by Pliny in a.d. 77 in his Natural History. Mela names the river Vistula (3.33), Pliny uses Vistla (4.81, 4.97, 4.100). 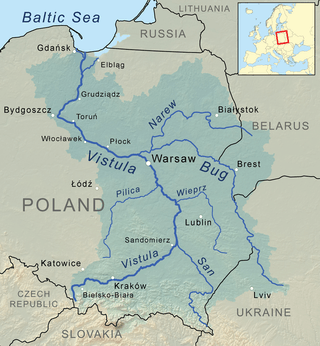 The root of the name Vistula is Indo-European *u̯eis- 'to ooze, flow slowly' (cf. Sanskrit अवेषन् / aveṣan 'they flowed', Old Norse veisa 'slime') and is found in many European rivernames (e.g. Weser, Viesinta). The diminutive endings -ila, -ula, were used in many Indo-European languages, including Latin (see Ursula). The reaches of the Vistula are composed of three stretches: upper, from its sources to the city of Sandomierz; centre, from Sandomierz to the mouth of Narew and Bug; and bottom, from mouth of Narew till Vistula's own delta at the Baltic. The Vistula river basin covers 194,424 square kilometres (75,068 square miles) (in Poland 168,700 square kilometres (65,135 square miles)); its average altitude rising to 270 metres (886 feet) above sea level. In addition, the majority of its river basin (55%) is located at heights of 100 to 200 m above sea level; over 3⁄4 of the river basin ranges from 100 to 300 metres (328 to 984 feet) in altitude. 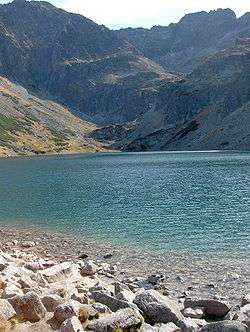 The highest point of the river basin lies at 2,655 metres (8,711 feet) (Gerlach Peak in the Tatra mountains). One of the features of the river basin of the Vistula is its asymmetry—in great measure resulting from the tilting direction of the Central-European Lowland toward the north-west, the direction of the flow of glacial waters, as well as considerable predisposition of its older base. The asymmetry of the river basin (right-hand to left-hand side) is 73–27%. The river forms a wide delta called the Żuławy Wiślane around the town of Biała Góra near Sztum, about 50 km (31 mi) from the mouth, splitting into two branches: the Leniwka (left) and the Nogat (right). In the city of Gdańsk the Head of the Leniwka branch separates again into the Szkarpawa branch, for the purpose of flood control closed to the east with a lock. The so-called Dead Wisła divides again into the Przegalinie branch flowing into Gdańsk Bay. Until the 14th century the Vistula was divided into a main eastern branch, the Elbląg Vistula, and the smaller western branch, the Gdańsk Vistula. Since 1371 the Vistula of Gdańsk is the river's main artery. After the flood in 1840 an additional branch formed called the Śmiała Wisła ("Bold Vistula"). In 1890 through 1895, additional waterworks were carried out up the Świbna. Widespread flooding along the Vistula River in south-eastern Poland. The history of the River Vistula and her valley spans over 2 million years. The river is connected to the geological period called the Quaternary, in which distinct cooling of the climate took place. In the last million years, an ice sheet entered the area of Poland eight times, bringing along with it changes of reaches of the river. In warmer periods, when the ice sheet retreated, the Vistula deepened and widened its valley. The river took its present shape within the last 14,000 years, after complete recession of the Scandinavian ice sheet from the area. At present, along the Vistula valley, erosion of the banks and collecting of new deposits are still occurring. As the principal river of Poland, the Vistula is also located in the centre of Europe. Three principal geographical and geological land masses of the continent meet in her river basin: the lowland Eastern European shield, the area of uplands and low mountains of Western Europe, and the Alpine zone of high mountains to which both the Alps and the Carpathians belong. The Vistula begins in the Carpathian mountains. The run and character of the river was shaped by ice sheets flowing down from the Scandinavian Peninsula. The last ice sheet entered the area of Poland about 20,000 years ago. During periods of warmer weather, the ancient Vistula, "Pra-Wisła", searched for the shortest way to the sea—thousands of years ago it flowed into the North Sea somewhere at the latitude of contemporary Scotland. The climate of the Vistula valley, its plants, animals and its very character changed considerably during the process of glacial retreat. Vistula valley east (upstream) of Toruń. 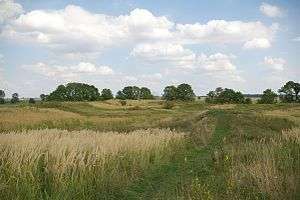 Large parts of the Vistula Basin were occupied by the Iron Age Lusatian and Przeworsk cultures in the first millennium BC. Genetic analysis indicates that there has been an unbroken genetic continuity of the inhabitants over the last 3,500 years. The Vistula Basin along with the lands of the Rhine, Danube, Elbe, and Oder came to be called Magna Germania by Roman authors of the 1st century AD. This doesn't imply that the inhabitants were "Germanic" in the modern sense of the term; Tacitus, when describing the Venethi, Peucini and Fenni, wrote that he was not sure if he should call them Germans, since they had settlements and they fought on foot, or rather Sarmatians since they have some similar customs to them. Ptolemy, in the 2nd century AD, would describe the Vistula as the border between Germania and Sarmatia. Death of princess Wanda by Maksymilian Piotrowski, 1859. The Vistula river used to be connected to the Dnieper River, and thence to the Black Sea via the Augustów Canal, a technological marvel with numerous sluices contributing to its aesthetic appeal. It was the first waterway in Central Europe to provide a direct link between the two major rivers, the Vistula and the Neman. It provided a link with the Black Sea to the south through the Oginski Canal, Dnieper River, Berezina Canal, and Dvina River. The Baltic Sea–Vistula–Dnieper–Black Sea route with its rivers was one of the most ancient trade routes, the Amber Road, on which amber and other items were traded from Northern Europe to Greece, Asia, Egypt, and elsewhere. A number of West Slavic Polish tribes formed small dominions beginning in the 8th century, some of which coalesced later into larger ones. Among the tribes listed in the Bavarian Geographer's 9th century document were the Vistulans (Wiślanie) in southern Poland. Kraków and Wiślica were their main centres. Many Polish legends are connected with the Vistula and the beginnings of Polish statehood. One of the most enduring is that about princess Wanda co nie chciała Niemca (who rejected the German). 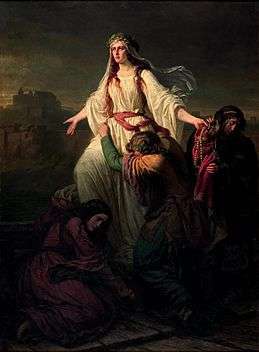 According to the most popular variant, popularized by the 15th century historian Jan Długosz, Wanda, daughter of King Krak, became queen of the Poles upon her father's death. She refused to marry a German prince Rytigier (Rüdiger), who took offence and invaded Poland, but was repelled. Wanda however committed suicide, drowning in the Vistula river, to ensure he would not invade her country again. 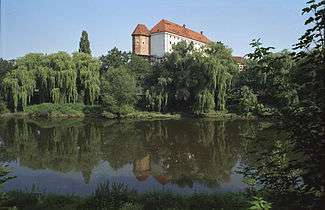 11th century Benedictine Abbey in Tyniec overlooks the Vistula. Vistula river near the Duke of Masovia Castle in Czersk. In the 14th century the lower Vistula was controlled by the Teutonic Knights Order, invited in 1226 by Konrad I of Masovia to help him fight the pagan Prussians on the border of his lands. In 1308 the Teutonic Knights captured the Gdańsk castle and murdered the population. Since then the event is known as the Gdańsk slaughter. The Order had inherited Gniew from Sambor II, thus gaining a foothold on the left bank of the Vistula. 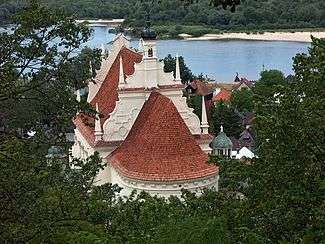 Many granaries and storehouses, built in the 14th century, line the banks of the Vistula. In the 15th century the city of Gdańsk gained great importance in the Baltic area as a centre of merchants and trade and as a port city. While at this time the surrounding lands were inhabited by Pomeranians, Gdańsk soon became a starting point for German settlement of the largely fallow Vistulan country. Before its peak in 1618, trade increased by a factor of 20 from 1491. The tonnage of grain traded on the river in key years is telling: 1491: 14,000; 1537: 23,000; 1563: 150,000; 1618: 310,000. In the 16th century most of the grain exported was leaving Poland through Gdańsk, which because of its location at the terminal point of the Vistula and its tributaries waterway and of its Baltic seaport trade role became the wealthiest, most highly developed (by far the largest center of crafts and manufacturing) and most autonomous of the Polish cities. Other towns were negatively affected by Gdańsk's near-monopoly in foreign trade. During the reign of Stephen Báthory Poland ruled two main Baltic Sea ports: Gdańsk controlling the Vistula river trade and Riga controlling the Western Dvina trade. Both cities were among the largest in the country. Around 70% the exports from Gdańsk were of grain. Vistula river (Vistvla fluvivs) in Toruń in 1641. The owner of a folwark usually signed a contract with the merchants of Gdańsk, who controlled 80% of this inland trade, to ship the grain north to that seaport on the Baltic Sea. Many rivers in the Commonwealth were used for shipping purposes, including the Vistula. The river had a relatively well-developed infrastructure, with river ports and granaries. 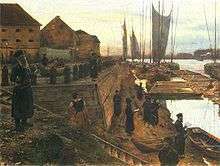 Most river shipping travelled north, southward transport being less profitable, and barges and rafts were often sold off in Gdańsk for lumber. In order to arrest recurrent flooding on the lower Vistula, the Prussian government in 1889–95 constructed an artificial channel about 12 kilometres (7 miles) east of Gdańsk (German name: Danzig)—known as the Vistula Cut (German: Weichseldurchstich; Polish: Przekop Wisły)—that acted as a huge sluice, diverting much of the Vistula flow directly into the Baltic. As a result, the historic Vistula channel through Gdańsk lost much of its flow, and was known thereafter as the Dead Vistula (German: Tote Weichsel; Polish: Martwa Wisła). German states got complete control of the region in 1795–1812 (see: Partitions of Poland), as well as during the World Wars, in 1914–1918 and 1939–1945. Jewish Feast of trumpets (Polish: Święto trąbek) at the banks of Vistula, Aleksander Gierymski, 1884. Kierbedzia Bridge over Vistula in Warsaw (c. 1900). This framework bridge was constructed by Stanisław Kierbedź in 1850–1864. It was destroyed by the Germans in 1944. The Polish September campaign included battles over control of the mouth of the Vistula, and of the city of Gdańsk, so close to the river delta. During the Invasion of Poland (1939), after the initial battles in Pomerelia, the remains of the Polish Army of Pomerania withdrew to the southern bank of the Vistula. After defending Toruń for several days, the army withdrew further south under pressure of the overall strained strategic situation, and took part in the main battle of Bzura. The Auschwitz complex of concentration camps was located on the Vistula, at the confluence of the Vistula and the Soła rivers. Ashes of murdered Auschwitz victims were dumped into the river. The 1944 Warsaw Uprising was planned with the expectation that the Soviet forces, who had arrived in the course of their offensive and were waiting on the other side of the Vistula River in full force, would help in the battle for Warsaw. However the Soviets let down the Poles, stopping their advance at the Vistula and branding the insurgents as criminals in radio broadcasts. ↑ William Napier (20 November 2005). "Building a Library: The Fall of Rome". findarticles.com. Independent Newspapers UK Limited. Retrieved 1 April 2009. ↑ Nazewnictwo geograficzne Polski. T.1: Hydronimy. 2cz. w 2 vol. ISBN 83-239-9607-5. ↑ Wysota, W.; Molewski, P.; Sokołowski, R.J., Robert J. (2009). "Record of the Vistula ice lobe advances in the Late Weichselian glacial sequence in north-central Poland". Quaternary International. 207: 26. doi:10.1016/j.quaint.2008.12.015. ↑ Zbigniew Pruszaka; Elżbieta Zawadzka. "Potential Implications of Sea-Level Rise for Poland". www.bioone.org. Retrieved 23 October 2009. ↑ "Final International ASTRA conference in Espoo, Finland, 10–11 December 2007". www.astra-project.org. Retrieved 23 October 2009. ↑ Matt McGrath (12 March 2009). "Climate scenarios 'being realised'". BBC News. Retrieved 23 October 2009. ↑ "Hydrology and morphology of two river mouth regions (temperate Vistula Delta and subtropical Red River Delta)" (PDF). www.iopan.gda.pl. Retrieved 23 October 2009. ↑ Państwowy Instytut Geologiczny (State Geological Institute), Warsaw, "Geologiczna historia Wisły"
1 2 Jędrzej Giertych. "Tysiąc lat historii narodu polskiego" (in Polish). www.chipublib.org. Retrieved 3 April 2009. 1 2 Paul Havers. "The Legend of Wanda". www.kresy.co.uk. Retrieved 31 March 2009. 1 2 "Wanda". www.brooklynmuseum.org. Retrieved 31 March 2009. ↑ Władysław Parczewski; Jerzy Pruchnicki. "Vistula River". Encyclopedia Britannica. Retrieved 3 April 2009. ↑ "History of the City Gdańsk". www.en.gdansk.gda.pl. Retrieved 3 April 2009. ↑ Rosamond McKitterick; Timothy Reuter; David Abulafia; C. T. Allmand (1995). Vol.5, ed. The New Cambridge Medieval History: C. 1198-C. 1300. Cambridge University Press. ISBN 0-521-36289-X. ↑ Krzysztof Mikulski. "Dzieje dawnego Torunia" (in Polish). www.mowiawieki.pl. Retrieved 3 April 2009. ↑ Jerzy S. Majewski (29 April 2004). "Most Zygmunta Augusta" (in Polish). miasta.gazeta.pl. Retrieved 25 October 2009. ↑ "Gdańsk (Poland)". Encyclopedia Britannica. Retrieved 3 April 2009. ↑ "Stephen Bathory (king of Poland)". Encyclopedia Britannica. Retrieved 3 April 2009. ↑ "SEPTEMBER 13, 1944". www.1944.pl. Archived from the original on 23 May 2006. Retrieved 25 October 2009. ↑ "Vistula River Victory". www.electronicmuseum.ca. Retrieved 3 April 2009. 1 2 Marek Jan Chodakiewicz (1978). Between Nazis and Soviets: Occupation Politics in Poland, 1939–1947. Lexington Books. ISBN 0-7391-0484-5. 1 2 "Warsaw Uprising of 1944". www.warsawuprising.com. Retrieved 14 July 2008. ↑ The Uprising remained the ultimate symbol of Communist betrayal and bad faith for Poles. John Radzilowski. "Warsaw Uprising". ww2db.com. Retrieved 25 March 2010. ↑ The Warsaw Rising was termed a "criminal organization" Radzilowski, John (2009). "Remembrance and Recovery: The Museum of the Warsaw Rising and the Memory of World War II in Post-communist Poland". The Public Historian. 31 (4): 143–158. doi:10.1525/tph.2009.31.4.143.